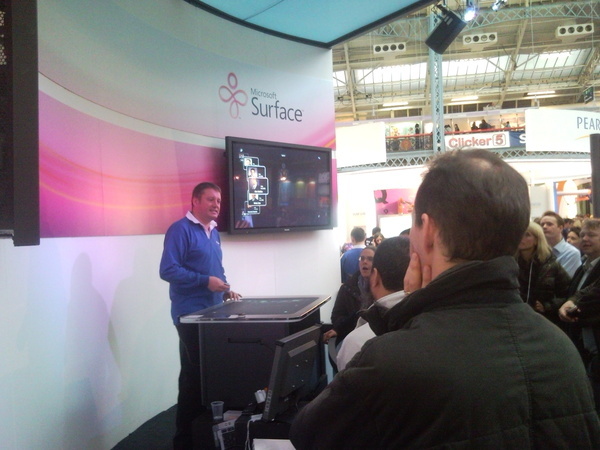 As anyone who’s been following the RebootIT Twitter feed today will know, I’ve been at the first day of the BETT Show 09. BETT (or British Education and Training Technology) is an education focussed technology event with the global industry giants of IT such as Microsoft right the way down to businesses run by individuals providing specialised learning materials. Whilst the Academy is not dealing directly with educating students, we do work in the HE sector and so the suppliers are often the same. Additionally we do need to train our own staff in technology and so there’s some parallels there too. I spent a few minutes at one of the two large Microsoft areas watching a demonstration of Microsoft Surface. This has been all over the Internet and in the media in general for some time now but this was the first opportunity I’ve had to see it actually being used. I had expected it to be a bit sluggish or non-responsive, but it was working really smoothly and Microsoft have obviously been investing in developing software specifically for using it in a school environment with a range of demonstrations including – wiping the screen to reveal an underlying image a bit at a time, building a photo collage and interacting with an intricate 3D model of the human heart. The reaction from the audience was verfy positive and the people around me were audibly impressed with it. This became particularly so as small groups were invited up to have a go themselves with some of the software and they all had no difficulty with it finding the interface very naturalo and fluid to work with. It was interesting to note that Microsoft had adopted the use of some finger based pinching gestures that Apple have used on the iPhone … but these gestures seem to be appearing on many of the laptops these days as “gesture enabled glide pads”. I had been looking forward to looking at some of the latest offerings from ASUS that might be useful for the Academy’s mobile workers. Unfortunately the tempting news item on the BETT web site about the new EEE tablet was a bit of a let down as there wasn’t one available at either of the ASUS stands. There were a variety of other ultra mobile laptop developers showing off their latest and greatest including Dell, HP and MSI. I also got a close look at the Sony TT Series laptop. Whilst the integrated web cam was not the best I’ve come across it is dockable and has the most amazing flexible screen I’ve seen – it looks much more durable than past Vaio machines. I revisited a couple of suppliers who I spoke to last year to see what updates they had. The first was a supplier for AceCad DigiMemo a clipboard that acts as a real time scanner and captures whatever you draw or write. This can later be exported or even OCR’d (handwriting recognition). Their update was a plugin Bluetooth module for the clipboard, but at significantly over sixty pounds (+ VAT) I think most people would stick with the ubiquitous mini-USB cable that comes with the clipboard. My other visit was to Mimio. They now provide a portable tablet device to remote control this portable interactive whiteboard and data capture system. This probably won’t be of much use in the Academy, but I can see how this would free a classroom teacher to be able to walk amongst the class whilst teaching and also allow children who maybe aren’t confident enough or are unable to stand in front of a class to use the system without leaving their desk. What I did discover however was that there has been a significant update to the Mimio Studio software and this is available from the Mimio web site as a free upgrade for existing customers. The Academy York office has both of these technologies available for staff to make use of, but I’m hoping to run some sort of show, tell and use session in the not too distant future to highlight some of the underused and unknown technologies that the ICT stores have to offer. BETT has a whole section on assistive technologies and since the Academy hosts and provides ICT support for JISC TechDis I also had a chat to some of the suppliers. One of particular note was HumanWare who provide a number of products for supporting people with visual impairments and visually related learning difficulties such as dyslexia. The item I found most interesting was an item called the BrailleNote – a kind of Braille laptop. It features WiFi, a Braille output, text to speech, and text entry for the onboard applications (word processor, e-mail, etc.). At the same sort of price as a low end laptop or a netbook this appeared to be a very functional and versatile device. Apparently there are cases that allow it to be worn at the waist and “used on the move” … but I’m not exactly sure how safe that is whether your sight impaired or not. Specifically in relation to events I had a chat to some guys from TxtTools about their SMS system for use by the Academy at the larger events such as the Annual Conference or Academy Away Day. The system essentially allows the routing and collating of text messages for groups. This allows an events team to text delegates reminders or changes to an event schedule and delegates to text in responses for evaluation of a session or questions for a live debate. Whilst I think that an RF based remote control system would be good for a consolidated session such as a main presentations (allowing for instantaneous responses, feedback in zero cell reception areas and typically more sophisticated data collection), the SMS approach allows people who are spread across a site to have simple, direct and personal interaction with the event when it suits them. So if you’re attending one of the aforementioned Academy events in the furture it may well be worth ensuring you have your mobile phone with you to take advantage of this sort of offering. An interesting theme throughout the event was that of robotics. Whilst not relating to the work of the Academy it was something you couldn’t really help but notice. As usual LEGO Mindstorms had a popular demonstration though they were having trouble with their coloured brick sorter when I wandered past – red and blue were good but yellow proved a bit of an issue for the new colour recognition sensor. There were also a couple of Wow Wee robots (such as Robosapien) suppliers providing programming software and another one from the Far East (probably Japan) that I’m sure was aimed at encourging kids to build little robots for the next series of Robot Wars. 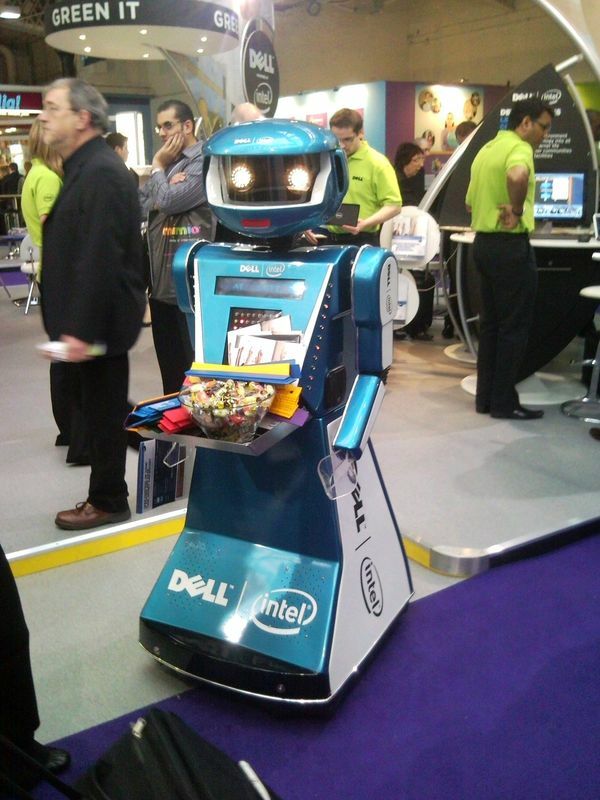 Finally Dell had brought along their robotic salesman. I was hoping to get some information at BETT around Virtual Learning Environments (VLE), remote and self-supported computer based training systems (CBT) and services for broadcasting and arranging online learning sessions. Most of the VLEs were heavily focussed on fulfilling the needs of primary or secondary education which was not surprising but I hadn’t expected the focus to be such that it really didn’t look professional enough to be used in a progressive corporate HE environment (for supporting the training of Academy staff). There was an organisation who support the leading open source VLE of Moodle, but I was amazed that there was no representative for Blackboard – the leading commercial package. Unfortunately I couldn’t find any CBT or broadcast based products to examine and talk to someone about. There were plenty of course materials bundled with the VLE packages on offer and also various video recording systems with online functionality, but there was nothing for really allowing the sort of CBT functionality and webcast/webinar functionality I was really looking for. I came across many others at my day in BETT and apologies if you didn’t make it to my blog post … but from my point of view you just weren’t quite interesting enough for me to blog to the masses about – so please don’t take offence. Hopefully I’ll be able to use some of the informaiton and contacts I made to good use and progress the efficiency and effectiveness of the Academy’s ICT services.